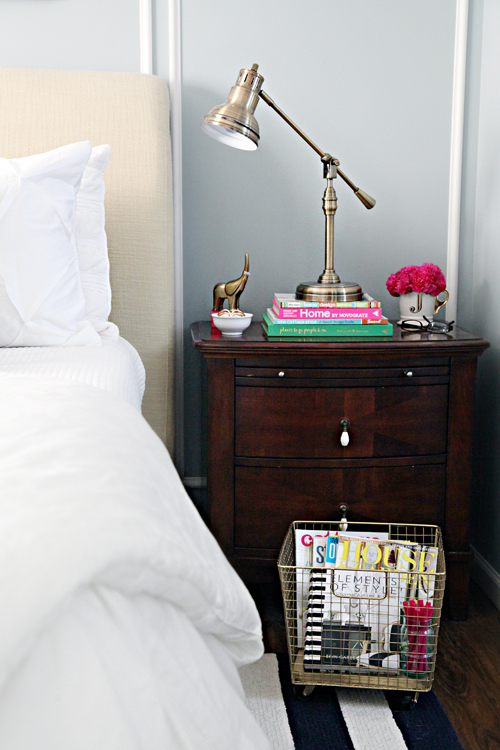 Yesterday I shared our plans for a little Master Bedroom refresh we have been working on. The updated bedroom is filled a few smaller, yet very simple DIY projects, and I will share more specifics regarding those in an upcoming post. For today, I am just excited to share the room I have been oohing and ahhing over since late last week. The bedroom isn't the easiest to photograph because our giant bed takes up so much of the room, making it nearly impossible to get a full shot. But hopefully I maneuvered myself into enough odd positions and angles that you will get an idea of some of the changes we have made. Fresh from the camera today, say howdy to our new space! It is always fun seeing the idea and plan come to life! 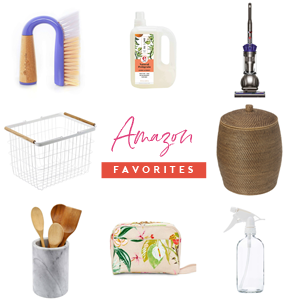 I shared all of the sources and details within yesterday's post here, and in an upcoming post I will share specific ways we found savings throughout the space. Today, sit back with your beverage of choice and enjoy the tour. 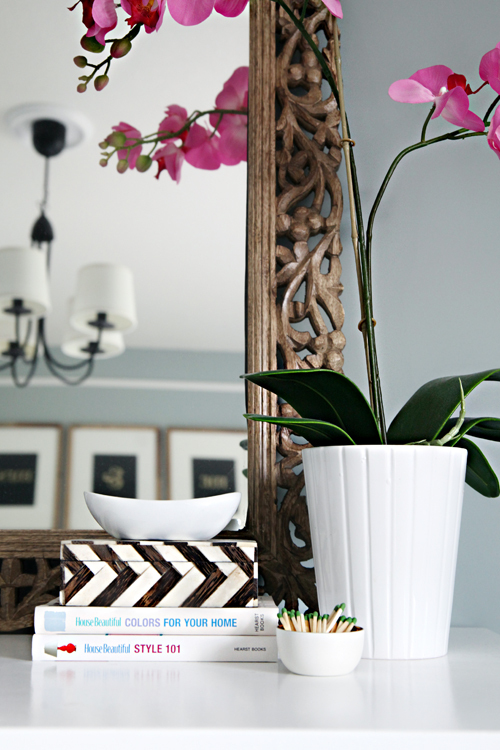 After I spotted this art print from Minted, I knew it would be perfect for the room. I also noticed that it contained many of the same colors we have been slowly integrating room by room within our home. It was a winner! It was also the driving force behind this room update. We didn't have to change much as the room previously had pretty good bones and was on the right track. The goal was to bring in a few new layers of color and to streamline existing pieces. We are not getting younger, and it was time that our room felt more our age. So I folded up the previous duvet and popped it into our linen drawer (for the next time I am itching for a change), and pulled out our white comforter. I actually much prefer the comforter as it is promoting daily bed making. Duvets tend to shift (even when clipped or tied on the inside corners), while the comforter just pulls right up nice and easy each morning without the fuss of wrinkles and straightening. Up until last week, we only had a set of white faux wood blinds covering our window. 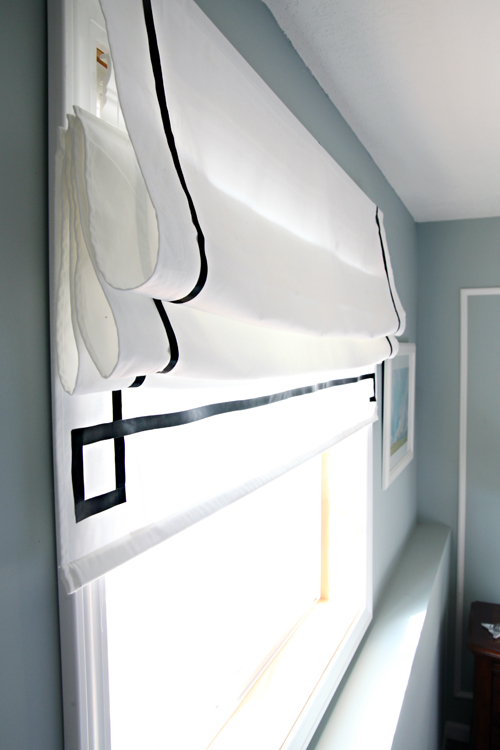 I found an inexpensive roman shade on Amazon's marketplace, and made a few modifications to it so that it would be more custom to our space. I love how the greek key embellishment mimics the angles and patterns used throughout the rest of the room. We still have our navy blue lamps, and although I am typically a girl who defaults to symmetry, a task lamp makes much more sense at my bedside. I like to work and read and write while laying in bed in the evenings, so I made sure to accommodate that part of my daily routine. 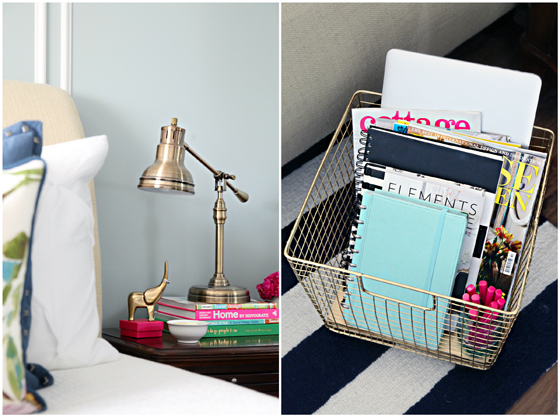 I also added a basket that can now hold all of my bedside clutter. Bryan uses one of the lamps on his side of the bed, while the other was moved to the dresser across the way. Speaking of dresser... I can't even begin to say enough about the difference that was made to the room by swapping out the old blue dresser for this new-old white dresser! The dresser is an old hand-me-down and has lived in our family for years. It was previously in our son's bedroom, however, he no longer needed it (more on that in a later post). I left the dings and dents to preserve a little character and history, but coated the entire thing with a glossy white paint. It completely modernized the piece and brightened the entire room. I also gave the previous hardware a coat of gold spray paint. 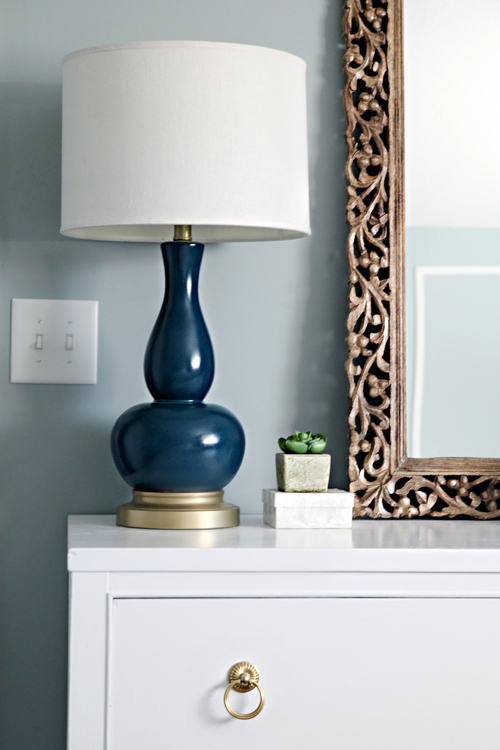 The mirror has an absolutely gorgeous detailing, and the warmth of the wood is a sweet balance to the sleek dresser. It also mimics the wood tone within the frames above the bed. The art within the frames was another DIY. I love how the gold foil glistens in the sun and the black ties together the chandelier and the ribbon on the shade. I also made a few changes within the adjoining dressing room. Nothing drastic in there, just took out the yellows and replaced the busy fabric on the jewelry board with a natural linen. As I always say, no room is ever deemed complete. Someday I will invest in better overhead lighting and install crown molding, but one day, one project at a time. For now, this sums up all of the changes and tweaking (not to be confused with twerking) we have been making over the past couple of weeks. 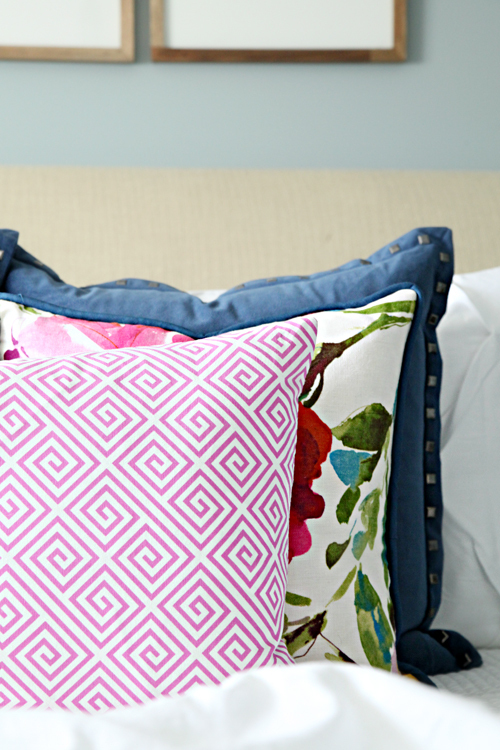 I am loving the bold new colors and how they flow with the rest of our playful home. A combination of a few new items paired with a lot of DIY and crafting and we have ourselves a more grown up and finished place to rest our heads. It was just what the Dr. ordered! I will be back soon with more details behind the many different items we DIY'd within the room to save on budget. I love this. I was JUST starting to think about how to bring color into my room, which has a white duvet. Love those pillows (source?). I also need some kind of window treatments. So many great ideas. Hey Jen! What happened to that gorgeous chandelier update you did with the beads.. Noticed it wasn't in the photos? Hi Jessa! I mentioned in yesterday's post that I snipped them down after I finished the room. They were competing with everything else we added. Oops didnt read that post! Thanks! This is gorgeous!! 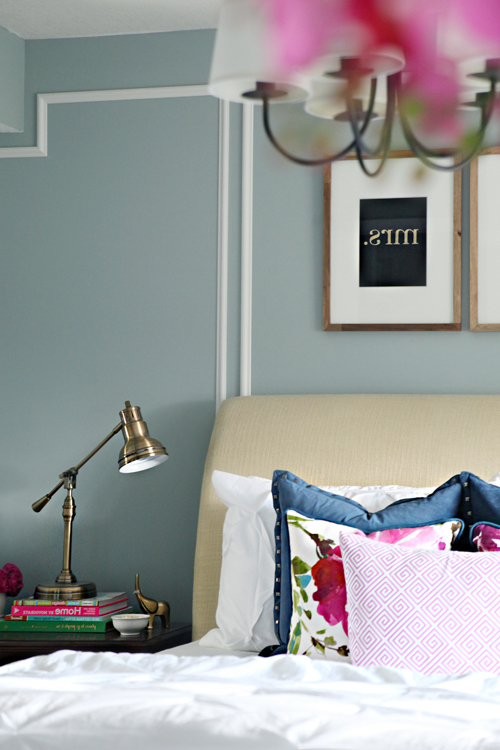 I LOVE the pops of navy combined with that beautiful, calming color of the wall. Perfect for a bedroom. It is nice and neat, but the colors of the pillows on the bed doesn't seem to be the right one. Where did you get the white ceramic hand to hold your jewelery? And the wired rolling basket holding your books/ magazine? Obsessed with this whole makeover. So nice! It's really bright and restful. I love the picture of you and your hubby on the wall...so adorable! 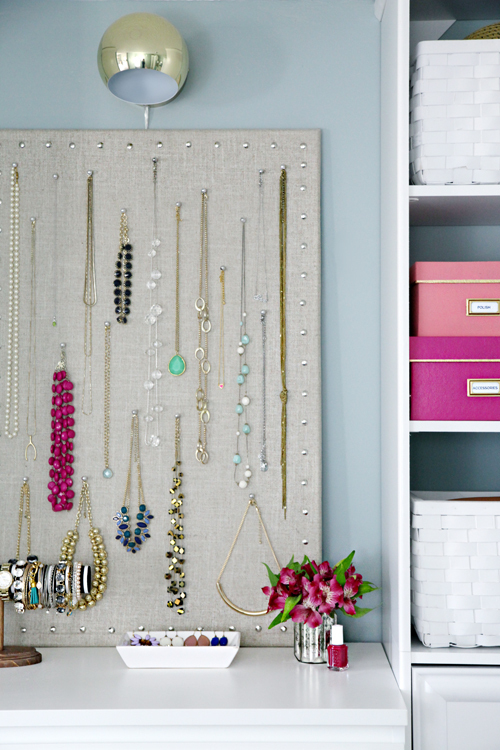 And I like the natural fabric on your jewelry board, restful on the eyes and really lets the colorful jewelry be the focus. I love this room! The color on the walls is so nice - I find it can be difficult to balance a color in the bedroom, trying to find something calm and serene, but not so bright that it is hard to relax. The framing (if that's what you would call it) on the wall behind the bed also looks really nice, very finished. I love it! 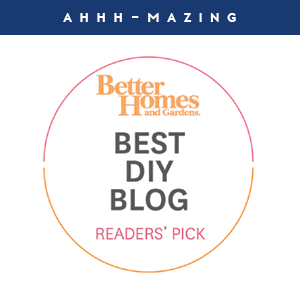 I so enjoy reading your blog and seeing the changes you make to your lovely home. You are truly inspiring. Thanks so much for sharing! Enjoy your beautiful new bedroom. Beautiful!! Just love the colors and texture and prints!! Very lovely and relaxing as a master should be! What color/brand is the wall paint? Looks like a perfect blue/gray I'm searching for! Hi Sarah! Thank you for your sweetness! The wall color is Behr's Frozen Pond. xoxo! Beautiful job, Jen! Everything came together so lovely! I think one of the reasons I love reading your blog so much is that you aren't afraid to fix those things that just don't work for you vs. settling once you've finished. And, you don't sit around with blank walls until you find that perfect fit (a habit I'm trying to work on for myself). Your room was well worth my one day wait to see the finished results...as you like to say...I lovity love it! The makeover is lovely. I'm curious about the matches in the white bowl on top of the dresser. Are those incense matches? Hi Jennifer! They are regular matches we use on a nearby candle. I just transferred the striking strip to the bottom of the candle instead. :) xo! You inspire me! I keep getting caught up in all the huge home reno projects we want to do (but simply can't afford to do all at once, of course!). ...sometimes I forget what a big difference a few small changes can make! Love this space! Wow - this room is beautiful! I love the changes you made. So pretty. :) Great job. Amazing as usual! I have that comforter but it's a duvet and I hate it! It's always wrinkly looking. Where did you get the comforter from? Thanks! They do! Thank you so much! Looks great! I would love to update our master and make it more "grown-up". Would you mind sharing where you got the white comforter? Hi Diana, I purchased the comforter at Target a year or two ago, but I believe they still carry it. Best of luck! It's perfect - I love how bright and fresh it feels! 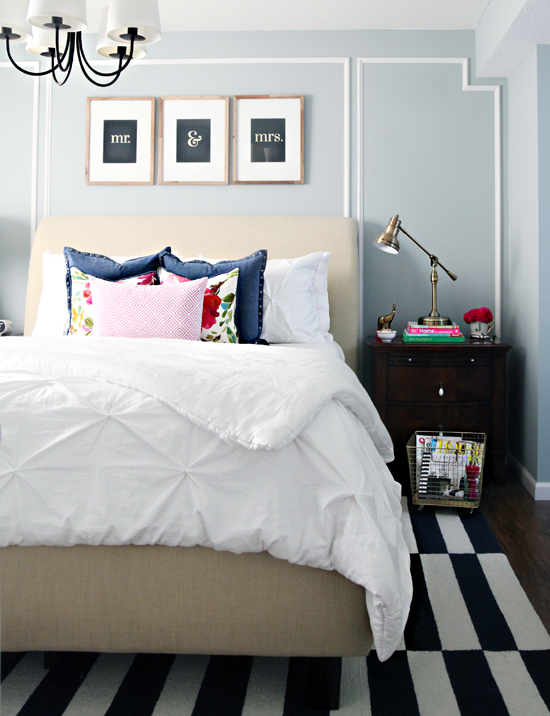 LOVE the molding behind the bed and the greek key roman shade is amazing .. I'm definitely going to try that sometime!! Very pretty! To me, this room is a great balance between modern colors and traditional staples which is a look I am always trying to achieve in our house! I am drawn towards a very traditional look, but I get bored with it easily so I find vibrant colors (and especially in pieces that can be easily changed out) is the way to go. 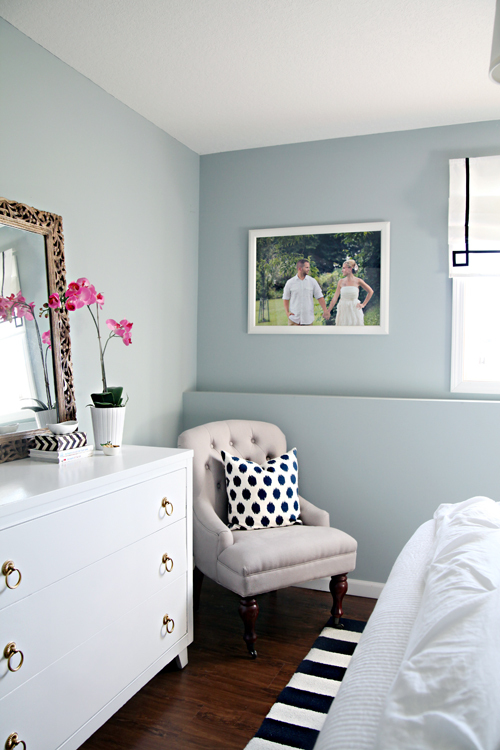 Definitely taking cues from this little makeover you did! Looks beautiful! 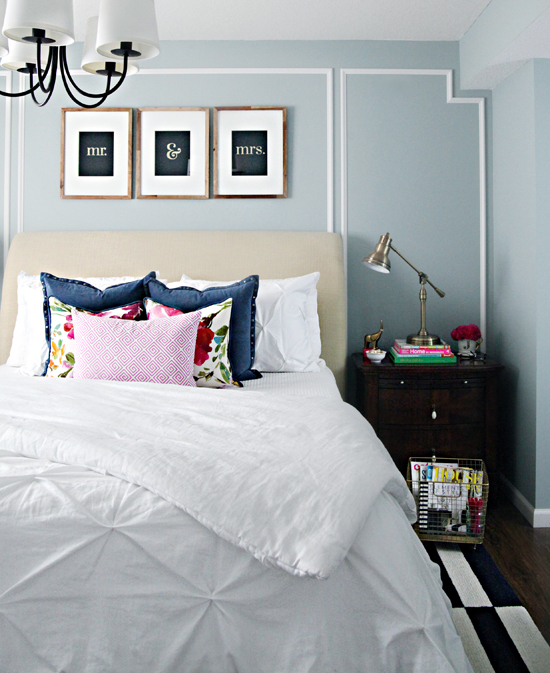 I love the neutral color of your bedframe and headboard! Where did you get it? It looks comfy! Thank you KT! We purchased it from Ashley furniture quite a few years ago. It is nice and comfortable for sitting up in bed. xoxo! love love love love love!!!! The space is so chic and so YOU!!! I love all the details! Speaking of...I need the deets on that chair! I think that the fact that your style keeps evolving makes your posts very relatable, I love that. The room is beautiful, very elegant and happy. Thanks for the inspiration! Thank you! I found it at Target. xoxo! I'm confused. I thought you had redone the chandelier in here with some pretty beads. But I don't see that in the pics. Have I lost it? Hi Kayla, I mentioned in yesterday's post that I snipped them down after I finished the room. They were competing with everything else we added. Love love love! I am always looking for new inspiration and girl you have got it going on! 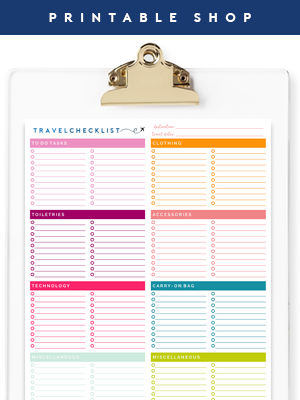 Thanks & thanks for the free printable! 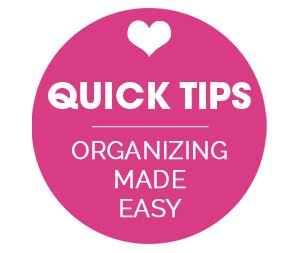 As a mom of 3 and OCD I am the queen of making lists and when I saw all your printable I almost fainted! Thank you again! gorgeous. where did you get the blind from? Jennifer... Did you happen to mention the color of the paint on the walls? The walls are Behr's Frozen Pond. What is the paint color of the dresser and what finish is it?? Thanks!! 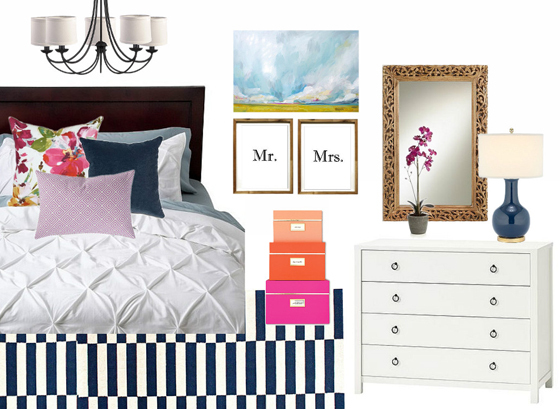 Our master bedroom is the one room in our house I am most itching to redo. My tastes have changed a little in the almost 9 years since we've been married!! My ideal redo would involve a new bed set though and we have nowhere to store our current one and would like to keep for an eventual guest bedroom. Sooo...I'm a little stuck for now. But dreaming of a redo! Jen it looks amazing! 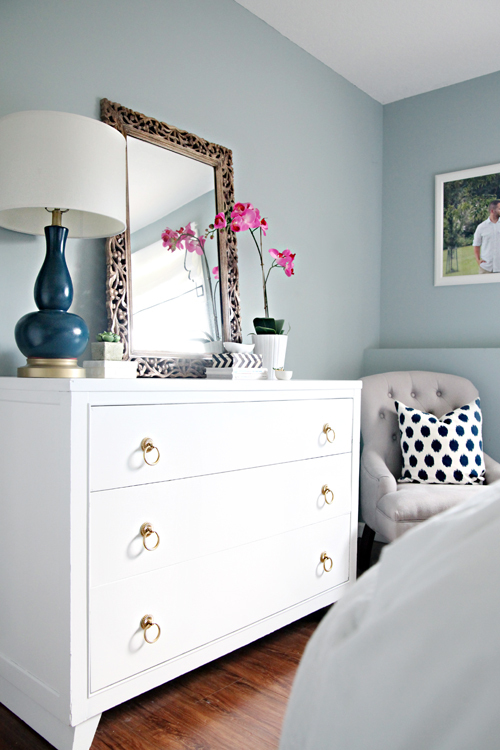 I love that print and the way the dresser turned out and the rug and everything. Great job and enjoy! beautiful! 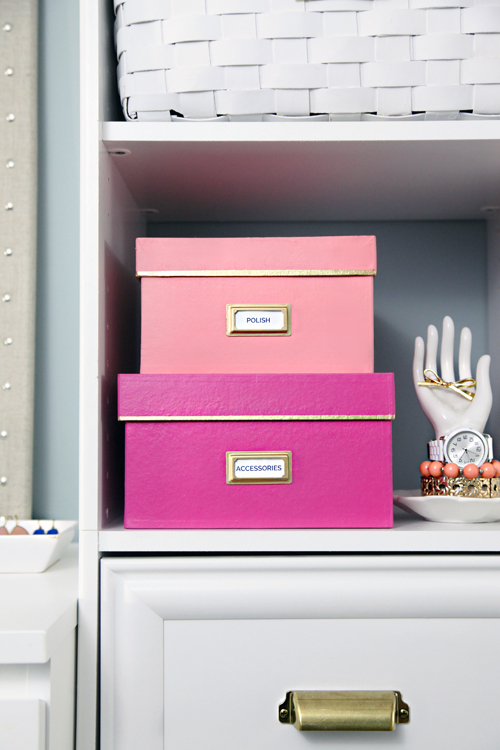 where are the pink storage boxes from?? Thanks Lindsay! I made the boxes, I will share the details in a post Friday. xoxo! I love everything you have done in your room, definitely gives me bedroom envy!! Would you mind sharing the wall color?? I love the pillow, the lamps, the rug, and the Minted print. I have ordered from them too. Great minds think alike! You've given me some great ideas for my own room too! What a beautiful bedroom! 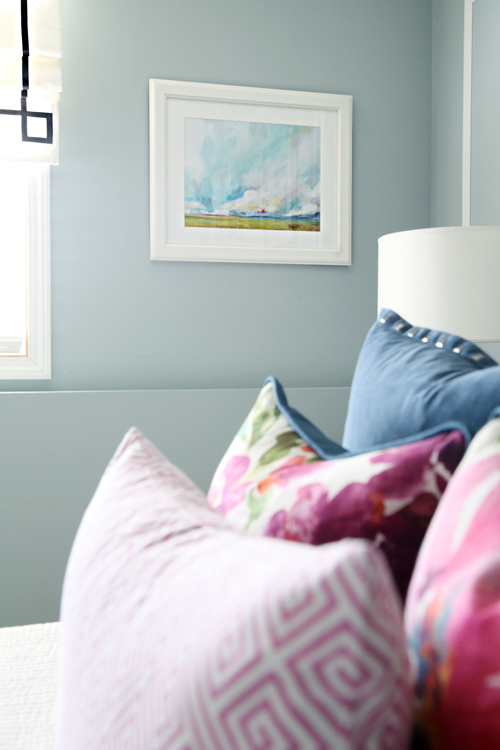 I love the calm and cool walls, and the pretty pops of color in the floral pillows. 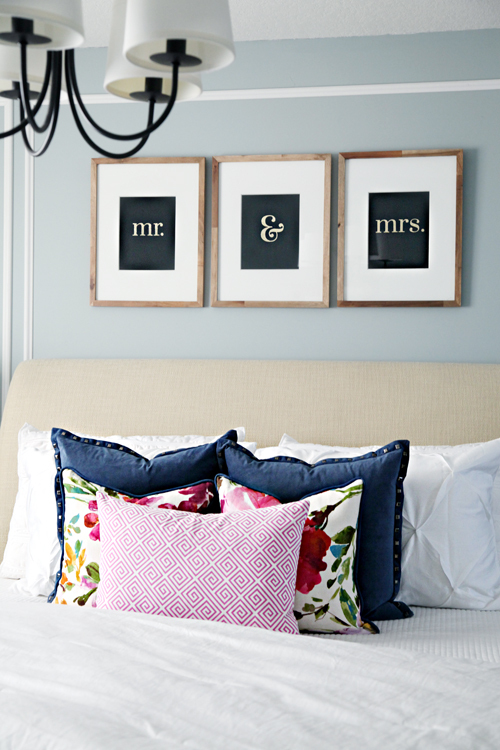 The art above the bed is just so sweet! Love it all! How did you make the prints on the wall? Hi Jen. I love the style of your task lamp. Where did you purchase it? Thanks! The task lamp was initially from Joss & Main, but I have seen similar types and styles at our local HomeGoods also. I love your style and your bedroom it is beautiful, as well as your whole house. 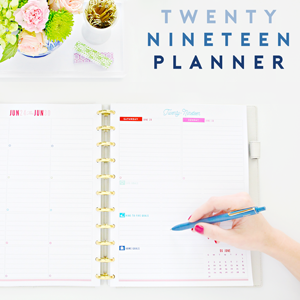 My "resolution" for this year is to refresh/redecorate and organize our home. One of the projects I've been working on is the "Mr. and Mrs." foil print. I final have all the materials together (I was waiting on the double sided adhesive from Amazon) and was working in the Silhouette Studio when I started wondering what font you were using? Then I was also wondering what font you used on the "Be Merry" foil print you did for Christmas (I really liked that font)? Thanks for opening up your life/home to us and for being such a wonderful inspiration! Thank you for the sweetness Dani! The font I used for the Mr. & Mrs. print was Prata. The Be Merry & Be Bright prints were created from a downloaded graphic I purchased from the online Silhouette store. The white quilt was purchased a few years ago from Joss & Main or Wayfair. I love the Emily Jeffords print! I have fallen in love with her work since discovering her just a few weeks ago, so seeing it on your wall was a fun surprise :) Out of curiosity, is your bed a king size? I hope you haven't been asked this question a ton but I didn't see it in the comments. We just got a king bed and I'm trying to decide on art for over the bed and pillow arrangements. Your room is lovely! Thank you Brittany! We have a queen sized bed. :) xo! Hi Jen! I LOVE reading your posts and seeing all of your great design ideas. 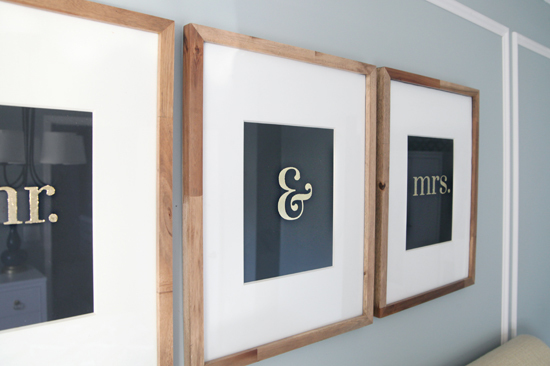 Where did you buy the frames for the Mr. & Mrs. prints? I'm assuming that they are the same frames as the stain removal prints in your laundry room, but I'm having trouble with that link. Thank you so much for helping me make my first house a home. Thank you Lauren! The frames were part of the Threshold line at Target from a year or two ago. They always seem to have beautiful wood frame options so hopefully you can hunt down something similar. xo! I absolutely love that comforter! It's so simple and clean, but the tufted effect makes it look so timelessly elegant! If my room looked like that, I would never leave!